Cost: Our bill came to £55 for 2 including service, without alcoholic drinks. Appetisers cost from £2 to £3.50. The main event, of course, is the hot pot - the broth base costs £7 or £8.50, and the ingredients placed on coloured plates denoting their price cost from £1 to £9.90 for the Japanese marbled beef. There is a set menu including a broth, dipping sauce, noodles and any of 3 items from the green plates on the conveyor belt for £9.30. About: Hot pot restaurants are hardly a novelty in London, with places like Chilli Cool in King’s Cross and Little Lamb on Shaftsbury Avenue. 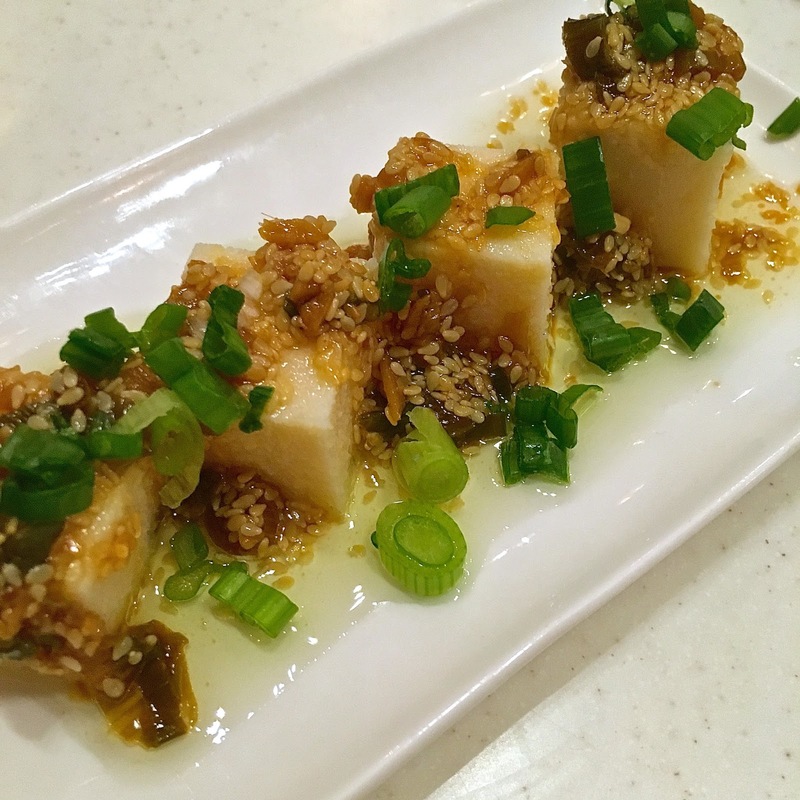 Opened in December 2015, Shuang Shuang however is a welcome addition to this restaurant genre. They offer hot pot, but not as we know it. 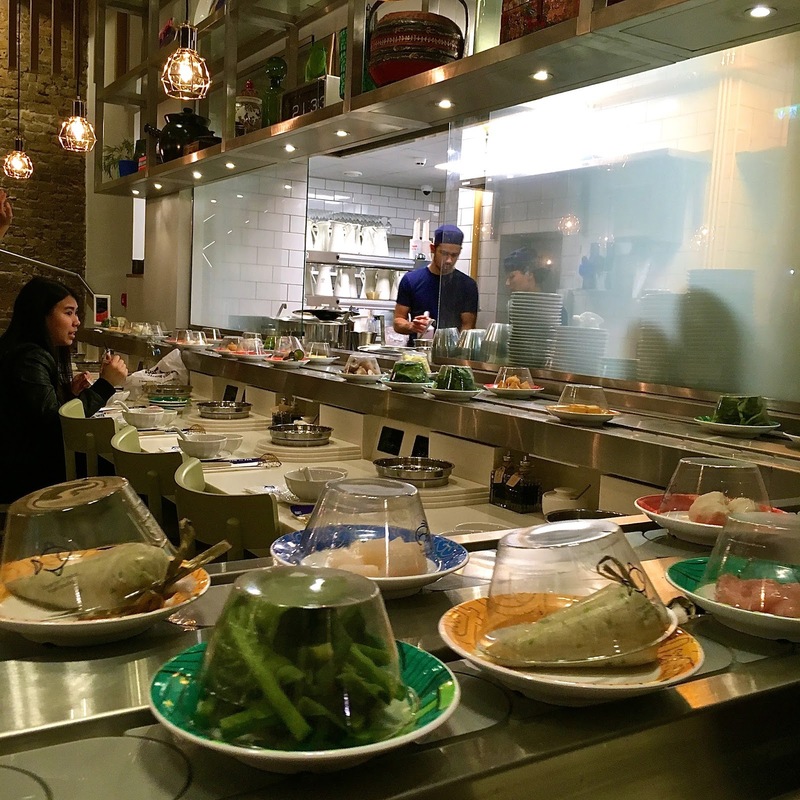 Here diners are able to pick their own ingredients, and as many as of these as they want, via a sushi-style conveyor belt. I have been to a number of hot pot restaurants where whole sets of ingredients are offered and paid for. The problem with this is that the best ingredients go quickly, while some unloved and unrecognizable vegetables are left over. But this is not the case at Shuang Shuang – you only add and pay for what you want to eat. Besides, diners can choose from a range of five different broths (mala with Sichuan peppercorns, chicken, lamb, seafood or vegetarian), which are brought to a gentle boil at the counter. Then a selection of fish, meat and vegetable items are chosen from the conveyor belt, with variable prices indicated by the colour of the plate. The recommended cooking time is indicated on the clear plastic lid. After dunking them in the broth for a few minutes, it's a simple matter of putting them into your chosen dipping sauce and popping them into the mouth. The restaurant is largely white, with a modern stylish feel to it, with young and helpful staff, and a hi-tech setting where diners control their own broth cooking station. What We Ate: We sampled all four starters. Pea tofu (£2) as the name suggests is made from peas rather than the usual soya beans, and was served with sesame oil and spring onions. I enjoyed this, particularly the interesting granular texture, very different from the Japanese tofu I usually cook with. Jasmine tea egg and nest (£3.50) was a preserved egg with a creamy, intensely scented yolk. 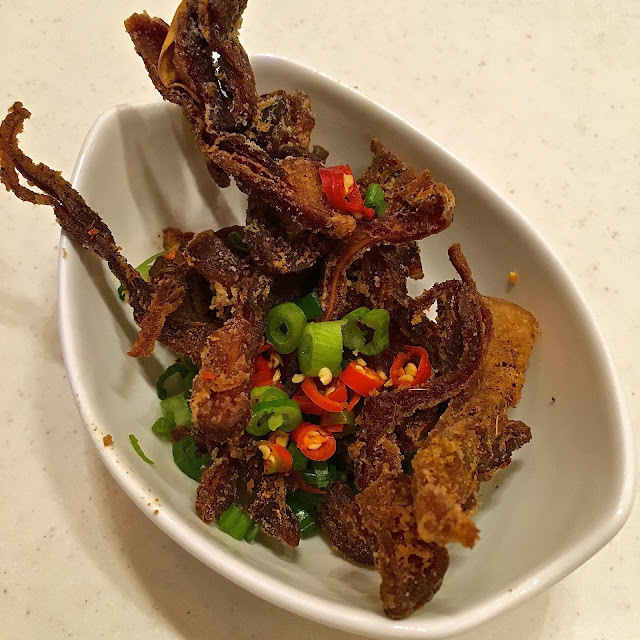 The pig's ears with Xingiang spice (£3) were excellent - deep fried until crispy and with a rich, smoky chilli flavour. Scallop and prawn fritters with mala oil (£3) were also very good, with an invigorating smack of chilli. 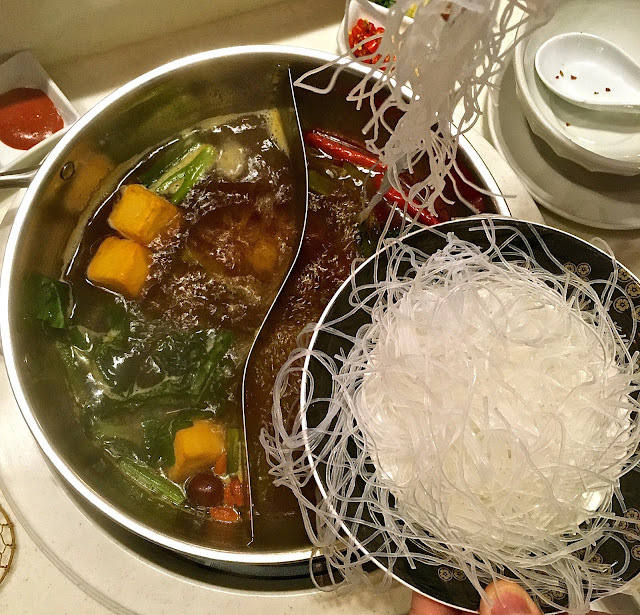 Our hot pot was divided into two sections, so we were able to choose two different broths. For one, we chose the mala broth (£8.50) – salty and fiery, made with dried chilies, Sichuan peppercorns, mixed herbs and fermented beans. I found this a little unbalanced, and I could taste the Sichuanese peppercorns with their heat and numbing qualities, but not much else. The black bird broth was gentler, made from black chicken, jujube red fruits and Chinese wolfberries. Once they came to a boil, we chose from the range of more than 40 ingredients on the conveyor belt. These included prawns, chicken, minced pork and prawn, scallop, and tofu balls, as well as greens and noodles. Vegetable options included chrysanthemum leaves, watercress, pak choi, pea shoots and choi sum. 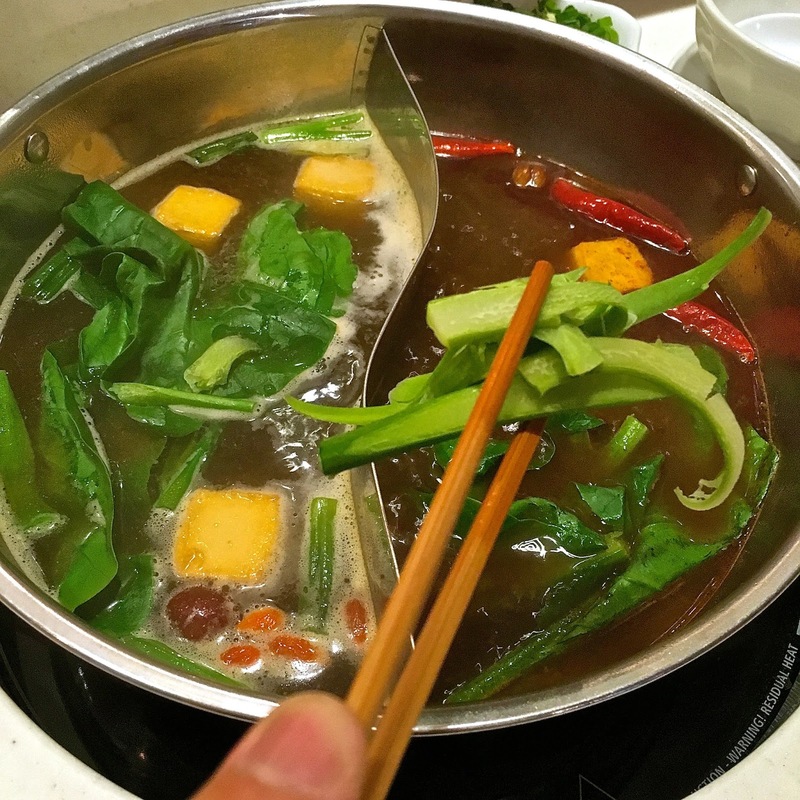 I enjoyed my hotpot at Shuang Shuang – the broths we chose were intensely flavoured, and the ingredients were fresh and varied. In addition, the service was excellent and our waiter explained with great detail and enthusiasm how to choose, cook and eat a Chinese hotpot. What We Drank: There are three white and three red wine options, starting at £27 for a French Viognier and £28 for a South African Shiraz. We had a glass of oolong tea at £1.50 each. Water is provided free of charge, which is commendable. Likes: I loved the crispy pigs ears, the black bird broth and the great range of ingredients to choose from. Dislikes: Shuang Shuang is not a restaurant that invites diners to linger by the conveyor belt, and seating there is not convenient for those in groups larger than 3. There is however seating for larger groups on the first floor. 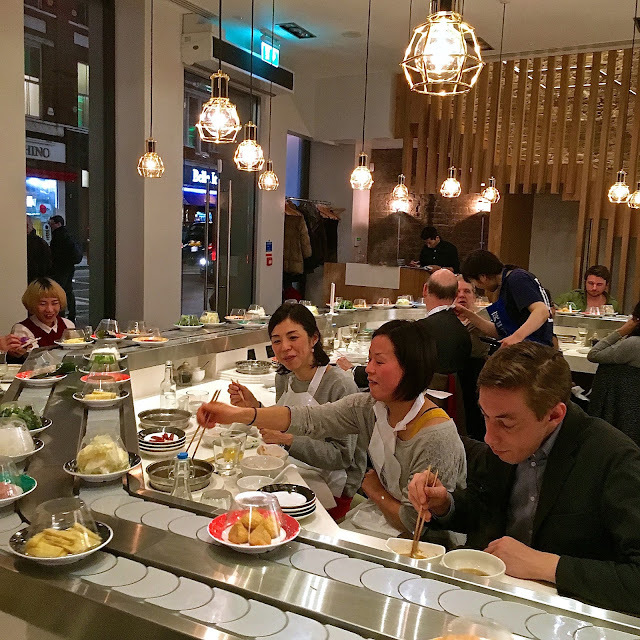 Verdict: If you have never tried a Chinese hot pot restaurant, Shuang Shuang is the most approachable of its kind in London. You won’t need to know much about the cuisine or its ingredients as the staff will happily guide you through. It is delicious, fun and good value. Recommended.